Ross Brand with your Livestream Universe Update and Flash Briefing for Wednesday, May 23rd, 2018. Are you a live streamer considering starting a new podcast? You probably already know about some of the great options for hosting you media files: Spreaker, Libsyn, Blubrry and more. One host you may not be aware of is WordPress.com. 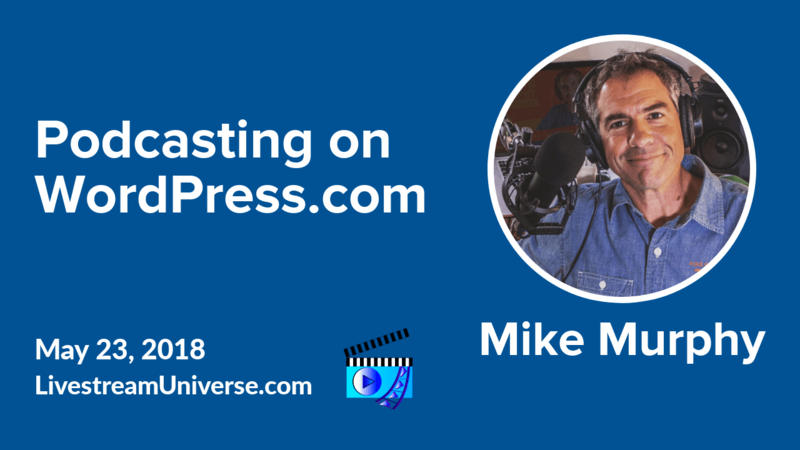 Mike Murphy has a new ebook available on Amazon that covers why WordPress.com is a viable option and how to set up your podcast on the platform. The title is “How to Podcast on Wordpress.com: The Step-by-Step Guide” by Mike Murphy. At 12pm ET, it’s the Business of Video Podcast with Owen Video and Nick Nimmin. 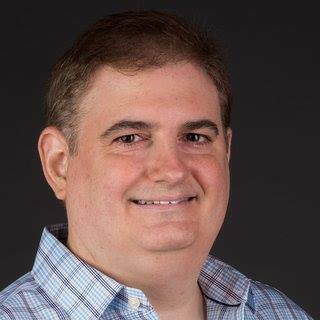 The topic is live video analytics and their guest is Nick Cicero of Delmondo. View on the Owen Video X Facebook page. At 2pm ET, it’s LegalHour.Live with Mitch Jackson and Joey Vitale. They’ll be discussing Website Terms of Service, Privacy and Disclaimer Agreements on the LegalHour.Live Facebook page. At 3pm ET, it’s Camera Confidence Live with Molly Mahoney. She will share what you need to know about GDPR so that you don’t put your business at risk. That’s on the BeLive TV Facebook page. And if you didn’t catch our Best of BeLive discussion on live streaming gear, the replay is available on the BeLive TV Facebook page. Rachel Moore and I appreciate all the great questions and insights shared during and after the show. Ross Brand with your Livestream Universe Update and Flash Briefing for Friday, April 20th, 2018. Are live streamers the new brand influencers? Janette Speyer, VP of Marketing at Web Success Team, thinks so. She writes in a crowded internet space, podcasters, web casters and live streamers are the answer to getting your product in front of new audiences. 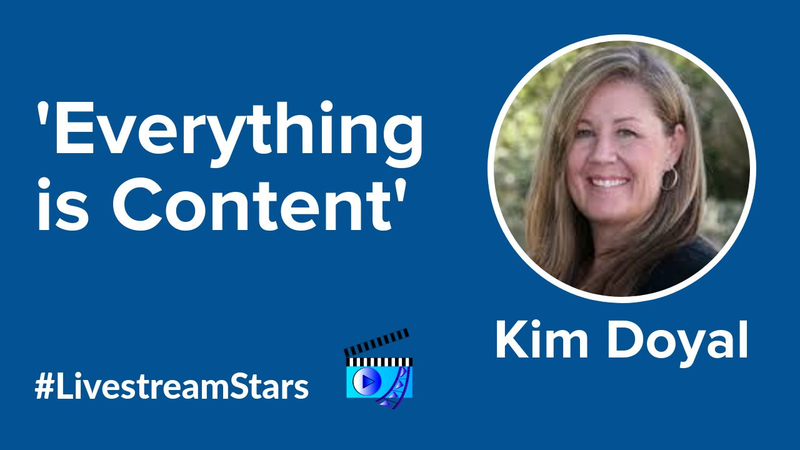 She cites the loyalty of livestream viewers, the passion hosts have for their show topics and the ability of brands to target a specific audience. Janette says Melissa Reyes and Tawanna Brown Smith are two live streamers who are delivering for the brands that work with them. You can read the article at WebSuccessTeam.com. We will hear from Janette Speyer on the Livestream Universe Update next week. 3pm ET – Eddie Garrison will be talking about his Facebook Live Training and Equipment Guide on his personal Facebook profile. At 11am ET, it’s Fork It Over Radio with Leslie Nance of go2kitchens and her husband/sidekick Robin. Get the latest news and tips on making your body inhospitable to cancer through your kitchen. View on Periscope or on the Fork It Over Radio Facebook page. At 12pm ET, Rob Greenlee and Todd Cochrane host a live audio-only edition of the New Media Show, You can catch it at SpreakerLiveShow.com. The Daily Livestram Update for January 11, 2017. Hosted by LivestreamUniverse.com editor Ross Brand. 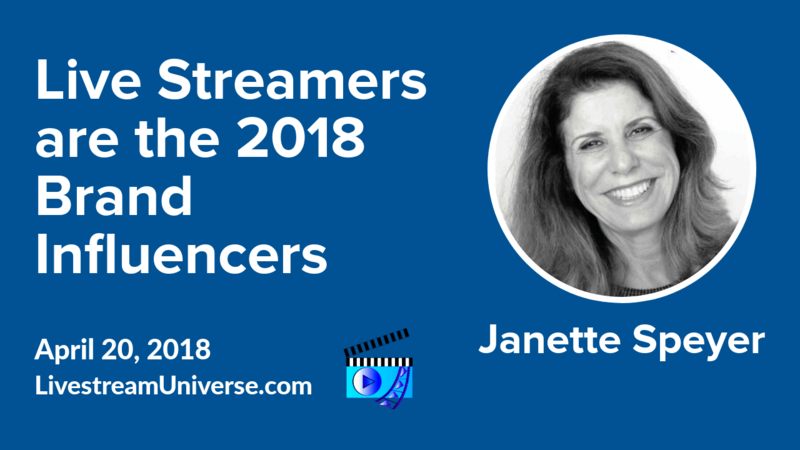 Jennifer Quinn talks about how she came to love collaboration in #livestreaming, Joel Comm shares 3 awesome ways to murder your business and #LetsLivestream covers producing with Telestream Wirecast. Plus today’s highly recommended shows featuring Wagner dos Santos, Leslie Nance, Rachel Moore, Jonathan Tripp, Jenn Nelson, John Carlton, Rj Redden, Mitch Jackson, Jennifer Edwards Hoverstad, Kim Garst, Claudia Santiago, Vicki Hainault Fitch and Courtney Smith Kramer. The Daily Livestram Update for January 9, 2017. Hosted by LivestreamUniverse.com editor Ross Brand. A busy day for Wagner dos Santos, Jennifer Quinn returns to #LivestreamStars and the rest of our highly-recommended (MON & TUE + WED Morning) livestreaming shows featuring Luria Petrucci, Leslie Nance, Rj Redden, Jeff Adams, BeLive.tv, Claudia Santiago, Tracey Brown, Melissa Reyes, Vicki Hainault Fitch, Charles G. Hanna, Terry Johnson, Terrilena Austin, and Francine Gregory. The Daily Livestram Update for December 19, 2016. Hosted by LivestreamUniverse.com editor Ross Brand. In the final update for 2016, Jenn Nelson of Wine Antics shares her holiday wine recommendations, a Blab Holiday Family Reunion with Joel Comm & Vincenzo M Landino, a celebration day for Leslie Nance of go2kitchens.com, who also will be making an announcement about Summit Live tonight on #LivestreamStars, and Luria Petrucci of Live Streaming Pros has advice for those taking time off from their shows. Plus more highly-recommended shows for today and beyond featuring Brian Fanzo, Jeff Adams, BeLive.tv, Rj Redden, Stacy Lynn Harp, Aaron Roth, Mary Desmond, Rachel Moore, CorkEnvy, Vicki Hainault Fitch, Dinesh Agarwal, Christian Karasiewicz and Nick Rishwain.